The Human Rights Commission of Pakistan (HRCP) welcomes the people’s verdict of February 18 and felicitates them on foiling the designs of the various elements that wanted to interfere with the electoral process through threats of violence, illicit influence, blackmail and bribery. This does not affect HRCP’s censure of large-scale manipulation of the electoral process before the polling day and the Election Commission’s failure to rise to the minimum acceptable standards of efficiency and respect for democratic imperatives. But these matters, as well as irregularities noticed during and after the polling, will be taken up in due course. At the moment all attention needs to be devoted to the possibility of transition to democratic and responsible governance created by the election result, and more importantly by the acceptance of this result by the people as well as all political groups, including those who boycotted the polls. There is no doubt that the people have not only voted against the erstwhile ruling party, they have in effect rejected the 9-year-old regime, its performance and its presiding deity. A sincere acceptance of the election result leaves President Musharraf with no option except his withdrawal from political scene. Even if the argument that he has been elected in accordance with law (as amended by himself) is taken seriously, it can be said that his election has been superseded by a broader-based election. The disclosure of General Musharraf’s involvement with poll-rigging in the 2002 election by Maj-Gen. Ehtisham Zamir, a former head of the ISI’s political cell, has not only strengthened the case for an immediate disbandment of this cell but has made the position of the incumbent head of state much more untenable than ever. HRCP sees no force in the plea against a change in the presidency on the ground that it might affect the war on terror. Indeed the restoration of decision-making powers to popularly elected representatives and their parliament will lend the state actions legitimacy and strength both and the performance of the armed forces in this area also should improve when they realize the importance of democratic sanction for their operations. Above all, resistance to change in the presidency will pollute the political environment, embolden anti-democratic professionals to undermine the national consensus and create unwarranted obstacles to the resumption of the people’s democratic journey. In order to speedily conclude the electoral process it is essential that the new National Assembly and the Provincial Assemblies must be convened as early as feasible as any undue delay will amount to a defiance of the popular will. The many crises Pakistan faces demand the earliest possible transfer of power to the newly elected representatives of the people. The issues at the top of the national agenda – restoration of the judges with due guarantees of the independence of the judiciary, removal of the provinces’ grievances against the centre, rationalization of the campaign against militants and extremists – must be addressed sooner rather than later. All restrictions on the judges and their families, lawyers, and political activists must be withdrawn forthwith. Further, there is no gainsaying that any tendency to put the common citizens aspirations for bread, job, and a decent living – on the back burner will undo the recent gains by democracy and cause dangerous frustration to the masses. Finally, HRCP wishes to hail the beginning of the end of the people’s alienation from policies and hopes that the country’s principal parties will help this trend by establishing rule by as large a democratic consensus as possible. Karachi: In a joint statement issued to the press Mr. Iqbal Haider, Secretary General, Human Rights Commission of Pakistan (HRCP) and Ms. Zohra Yusuf, Vice Chairperson, HRCP strongly condemned the police violence on a peaceful demonstration of lawyers gathered outside the city court, Karachi, demanding the restoration of disposed judges, independence of the judiciary and rule of law. The excessive use of force by the police and others in plain clothes including firing, tear gassing and baton charging on a peaceful gathering of the lawyers of Karachi is a shameful attempt to not only suppress the lawyers’ movement but also to sabotage the democratic process arising from the elections of February 18. It is obvious that the collaborators of the autocratic rule of President Pervez Musharraf are attempting to destroy peace and harmony in the country to create serious problems for the newly elected government, the statement said. Such acts are in violation of the constitution, human rights and civilized norms. HRCP commends and supports the admirable and consistent struggle of the lawyers for independence of the judiciary, rule of law and freedom of expression. Attached please find an image of a press release from Mr. Munir A. Malik, Former President, Supreme Court Bar Association. HRCP has just facilitated Mr. Malik, in sending this press release to you. Should you require further information, please contact Mr. Munir A. Malik directly. Lahore: The Human Rights Commission of Pakistan applauds the people of Pakistan who overcame several obstacles and despite pre-poll rigging gave a clear verdict in favour of democratic governance. Regrettably, this opportunity was not available to the electorate in Balochistan. Boycott of worthy political leadership from contesting the elections and their call for staying away from the polls; have not reflected a genuine will of the people of Balochistan to the 2008 polls. This will pose a challenge to the federal parliament as well as the future provincial government of the Province. The people of Pakistan have placed a monumental responsibility on the winning political parties to ensure that the democratic transition takes place. In addition, there are expectations from the new Parliament to restore the deposed judiciary, improve law and order and to solve the economic crisis. The new government will also be expected to find imaginative ways of combating terrorism, without putting the lives of non-combatants in danger. This will require policies and actions built through consensus. Unilateral and rash decisions of the past have not curbed the rise of ‘talibanisation’ but added to the miseries of the people. A large number of people have been displaced, lost their lives and been regularly exposed to violence. Pakistan’s civil society, too, must continue to play their role and maintain closer interaction with political parties. HRCP would also like to express its gratitude to all foreign observers, who traveled to Pakistan to monitor our elections. Despite, the threat of violence, these observers came to ensure that the true voice of the people of Pakistan could be heard. The message is clear: rule by the military can no longer be tolerated, whether in the name of combating terror or in the garb of delivering a transition to democracy. HRCP will not be monitoring the polls, neither by itself nor in partnership with anyone. All HRCP offices and fieldworkers will be observing certain aspects of the elections, i.e. they will be watching and assessing the electoral process – pre-poll, during polling and post-poll – as it is part of Pakistan Coalition for Free, Fair and Democratic Elections (Pacfrel). (New York, February 15, 2008) – In an audio recording obtained by Human Rights Watch, Pakistan’s Attorney General Malik Qayyum stated that upcoming parliamentary elections will be “massively rigged,” Human Rights Watch said today.In the recording, Qayyum appears to be advising an unidentified person on what political party the person should approach to become a candidate in the upcoming parliamentary election, now scheduled for February 18, 2008. Repeated attempts by Human Rights Watch to contact Qayyum by phone were unsuccessful. (New York, February 12, 2008) – The failure of Pakistan’s Election Commission to act on allegations of irregularities means the electoral machinery for national elections due on February 18, 2008 cannot be considered impartial, Human Rights Watch said today. The structure of the commission, which has wide powers to investigate complaints and take action, also suggests it will not rule fairly in the election. Since the official election period commenced in November 2007, the Election Commission of Pakistan has ignored allegations of widespread irregularities, including arrests and harassment of opposition candidates and party members, and the misuse of state resources, administration and state machinery to the advantage of candidates backed by President Pervez Musharraf. 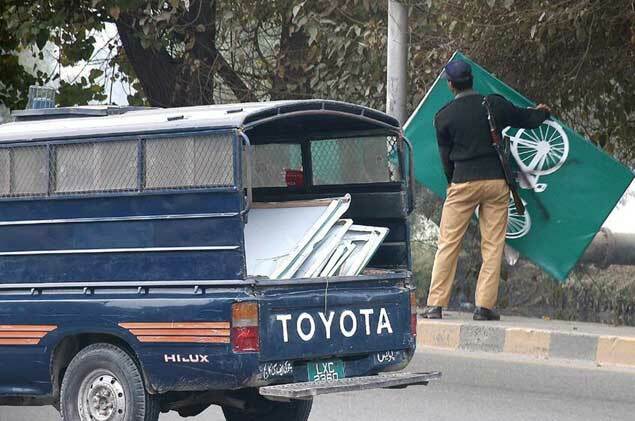 Human Rights Watch said that the Election Commission has taken virtually no action on the widespread harassment of opposition candidates through the registration of police cases against them, police obstruction of opposition rallies, and the removal of lawful opposition banners and billboards.